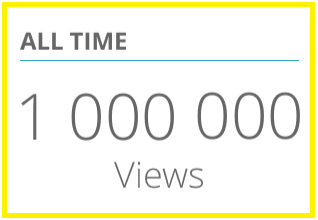 Last week this blog reached 1 million (1.000.000) views, which is really amazing in my world. I could never dream of that when I started this blog back in 2011. This post contains my humble THANKS to everyone who have visited, contributed, volontarily or in any other way, and foremost, thanks to all the great feedback you have given me! Keep it coming, it is Always nice to know that I’m helping you out there, same as other peoples blogs help me. I’ll try and keep delivering good quality posts to all of you, higher quality comes at a lower frequency, but I feel that quality is preferable to quantity in this field. The given topic is SharePoint but I’ll also try to fill in blanks where there is a need on other topics. Until the next post, have a great summer folks! Thanks to all of you, no one named, no one forgotten!